Producing his first works in 1997, aged 75, Bedford soon became recognised as an important artist and innovator through his unique depictions of East Kimberley history, evolving the artistic tradition forged earlier by Rover Thomas and Paddy Tjaminji. Crafting his own representations of country, Bedford’s formal language is characterised by a symbiotic relationship between bold forms and an elegance and balance in composition. His painting evokes rocky escarpments, rivers and other amorphous features of the Kimberley landscape whilst at the same time containing a learned and poetic knowledge of the land and its creation stories. Depicting the country of Twenty Mile (Girlingmanji), a bore site southwest of Bedford Downs Homestead close to the Springvale-Landsdown road, the site is characterised by black soil plains running out to the base of the Durack Ranges. Spring Creek runs through this place and it is close to the old Bedford road. Notably, Bedford's grandfather was tragically killed during a fight in this country. 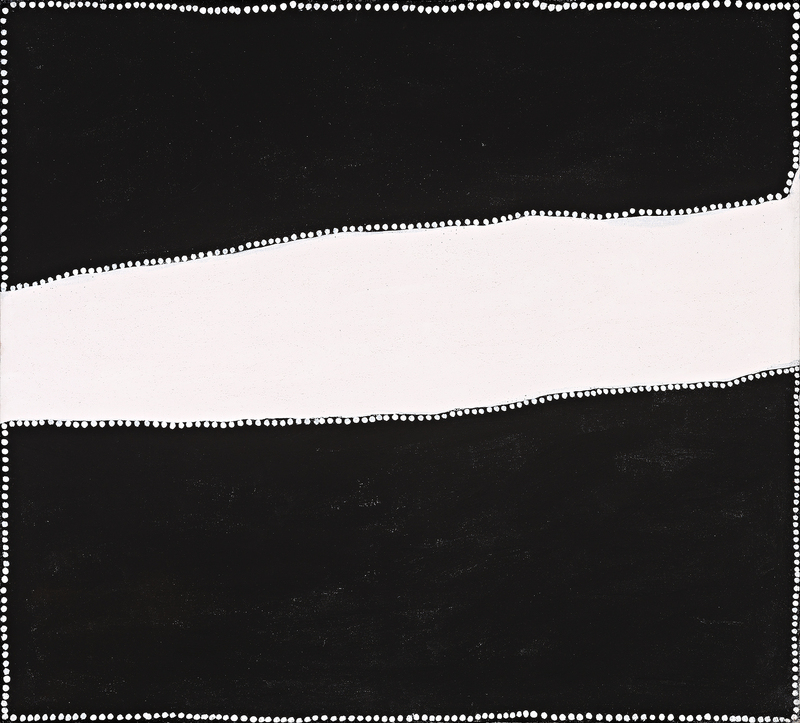 Catalogued as painting PB 5 1999.46 in Bedford's chronological index of works, this painting dates from 1999, the second year of the artist's painting career and exemplifies Bedford's move away from the more familiar style of the earlier east Kimberley painters. With his elimination of the ochre palette and introduction of starkly contrasting black and white, the interplay between positive and negative space is highlighted and the form becomes dominant.